Licensed production of the Antonov An-148 twin-jet transport in Russia has come to an end with the completion of the Russian defense ministry’s order. The final example for the customer took to the air on October 17 from the airfield of the VASO plant in Voronezh where the assembly line is located. In 2013, the ministry awarded VASO a contract worth 18.4 billion roubles for 15 An-148-100Es. Following the civil war in the Ukraine, the manufacturer began experiencing problems with receiving Ukrainian-made components, which delayed completion of the order for over a year. Today, the Russian defense ministry operates nine An-148s at Chkalovsky air force base near Moscow, and four others from Levashovo and Rostov-upon-Don. The last pair will be based at Koltsovo. The aircraft are employed on personnel- and freight-transportation duties. Earlier, VASO parent United Aircraft Corporation stated that, without further contracts for the type, An-148 production will be terminated. The company attributes the lack of demand to potential customers hesitating to place orders because of the fear that the disagreements between Russia and Ukraine could interfere with production and after-sales support. In view of the rift that has developed between Moscow and Kiev since late 2013, VASO accelerated the transition from the An-148 to the domestically designed Ilyushin Il-112, with the intent of producing 12 such turboprops annually. However, flight tests of the first prototype have been repeatedly postponed due to delays with shipments of the engines. Bench testing of the Klimov TV7-117ST turboprop was completed last year. The first set of deliverable engines arrived at VASO in April. The Il-112 first flight is expected shortly, with a rollout scheduled for later this month. The Il-112 has similar weights and dimensions to the An-26 it is intended to replace but differs by having a notably larger cabin cross-section, allowing it to accommodate 44 armed soldiers instead of 38. Thanks to the engine's reduced specific fuel consumption, which is down by 38 percent, the Il-112 has twice the ferry range, at 5,200 km (2,808 nm). The crew is reduced from six to two thanks to modern avionics and onboard equipment. The Ilyushin project has suffered several halts, each time the primary cause having been the offer of cheaper Ukrainian designs from Antonov. Although not fully compliant to the customer specification, the An-140 was acquired by the Russian defense ministry, which bought 10. Follow-on orders were expected but did not materialize due to worsening Russian-Ukrainian relations, but the ministry did purchase the 15 larger An-148s. 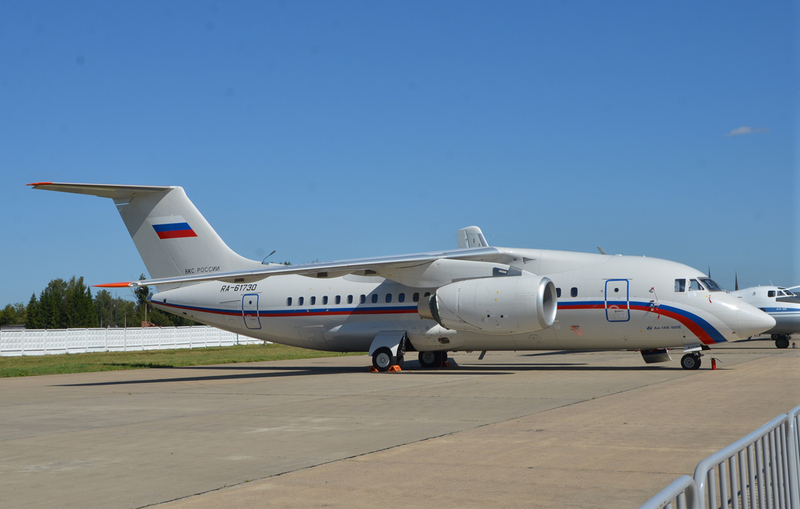 About 50 An-148s have been completed so far in both Ukraine and Russia. As well as the 15 aircraft for the defense ministry, other government organizations ordered 11, of which seven have been delivered. With commercial orders taken into account, VASO completed 33 An-148s between 2009 and 2018, of which two have been lost in crashes in 2011 and 2018.